Did you know that once you develop periodontal disease, the problem will continue to progress without treatment? Eventually, the disease can become periodontitis, leading to loose teeth and in many cases, adult tooth loss. However, treating the issue can reverse the damage and help your smile remain healthy and whole. There are a number of different ways to address gum disease. Undergo a deep cleaning: If you suffer from the early stages of the disease the doctor may be able to treat the issue and reverse the damage with periodontal therapy. Also known as a deep cleaning, the procedure involves removing plaque from the tooth surface via scaling and removing buildup from the root surface with a root planing. Doing so reduces inflammation and allows gums to attach to the teeth again. Receive a laser periodontal treatment: A laser treatment allows a doctor to remove infected gingival tissue and plaque from the surface of the roots. Healthy gum tissue can once again adhere to the teeth, closing periodontal pockets and improving oral health. Consider pinhole gum grafts: If you suffer from gum recession, this procedure involves making a tiny pinhole in the gums, then administering a collagen material. The doctor can then manipulate the gums to correct the recession, improving both the healthy and appearance of the smile. 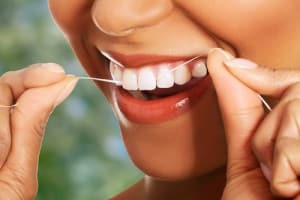 Floss daily: Flossing can remove the food caught between the tooth, food that bruising may not reach. Doing so can reduce the risk of inflammation, decreasing the chances of periodontal disease developing. Have your teeth cleaned routinely: You should have your teeth cleaned by a dentist at least once every six months to keep your gums and teeth healthy, clean, and free of oral health problems.